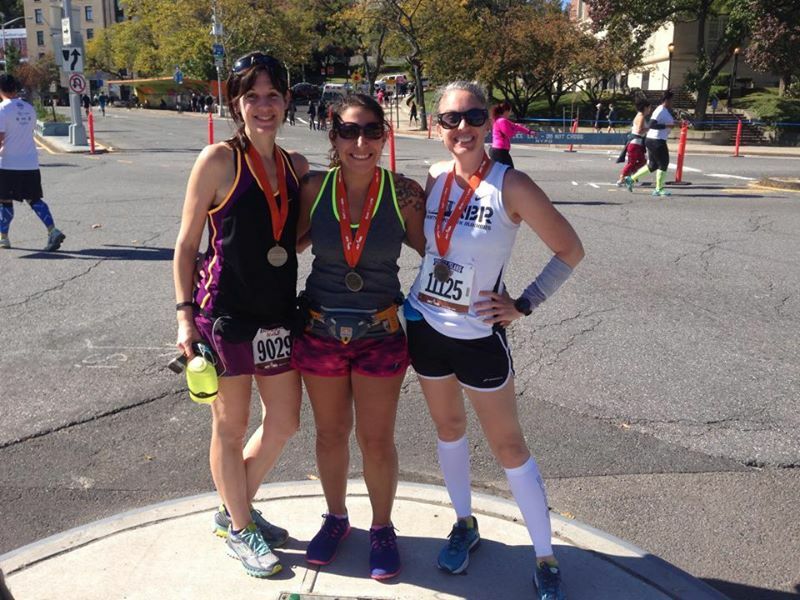 Two weeks after running my first 10 mile race, my first half marathon was on deck and I wasn’t looking forward to it. When I decided to do my 9+1 guaranteed entry, I had left this one off the list because I didn’t think I would be trained enough for it. But after the whole qualifier debacle, I ended up needing it for my 9. And after the 10 miler, I was nervous. Two of my running pals were running the half and one offered to pick me up on race morning and give me a ride to the start line. This was a major solid as the only way to get to the start other than driving is by ferry. Without a ride, I would have to leave my apartment by 5:45am and do bag check which because of NYRR’s security standards can be a hassle. So she swung by around 7am, we grabbed coffee, and headed out on the expressway towards Staten Island. Once we were on Staten Island, we found parking fairly easily and pretty close to the start. It was chilly and little windy. I was wearing shorts, a singlet, arm warmers, and calf compression sleeves and was hopping around to keep warm. We made a quick pit stop in the Staten Island Yankees Stadium then headed to the corrals. The start seemed to take forever. It took so long for us to get moving and once we finally did, we had quite the shuffle to the start. I was just glad to get moving. Not only was I cold, but a girl standing in front of me had a crazy out of control pony tail that she kept flicking all over me and people had been pushing their way through the corrals instead of walking up the sides and stepping in. Once we got to the start, it wasn’t much better. It was crowded and people were aggressively passing. This always amazes me, by the way. I feel like for the first two miles of every race I am dealing with people fighting to pass and somehow during the last two miles I am always trying dodge zombies. The corral system is supposed to ensure runners of similar speeds are grouped together, but I think at my pace there are bunch of people that go out too fast and end up hurting in the end. Anywho, the first two miles of the race were much like those of all the rest and I spent a lot of time sticking to the side of the course and dodging people. My pace was on point at mile 3 and I was feeling good. I planned to race conservatively for the first 10 miles then really push the last 5k if I had it in me. I could tell already though that I was feeling better than I did in the 10 miler. Of course, I had prepared for the race two days in advance and the night before I made sure to get a good carb filled dinner in (GF cornbread and veggie chili! NOM!) and a fair amount of sleep. Still, I was surprised at how good I felt especially since after my 10 miler I had spent a week in Florida and fell of my training (and nutrition plan) a bit. Maybe the vacation helped or my two days of preparation were paying off. No matter what it was, I was no longer nervous. I ran into a teammate on the course. We had never met in person so I introduced myself. We proceeded to slingshot each other for the rest of the race. This race was an out and back like the 10 miler so we got to see all the people ahead of us heading to the finish starting around mile 3 or 4. Once again I enjoyed cheering the super speedy runners as they headed towards a race win or placement. Around mile 4 I noticed some portapotties without a long line so I took the opportunity. Since I was just trying to finish I didn’t feel rushed, but I still wanted to try my best to reduce time stopped. I also took my first gel around mile 4. Mile 9-9.5 is the major hill of the course. Once you get passed it, there are some rolling hills but that one is the beast. It was tough, but since I had been running conservatively I was able to run the entire way up while most everyone else was walking. I felt great. Around mile 10 I saw another set of portapotties without a line and decided to stop before my final push. I was running out the door before I had even gotten myself entirely straightened. I was ready to rock this course! Around 10.5 miles there is an overpass you run under and they had a DJ playing. As we approached, I removed my earbuds and was totally pumped when he started playing “Blitzkreig Bop” by the Ramones. Fist in the air, I ran under the overpass singing along. I couldn’t believe how awesome I felt! Less than a 5K to go and I was feeling strong! Miles 11 and 12 were interesting. I was feeling awesome and running at an impressive clip (for me), but I was surrounded by zombies. People were walking 3 and 4 people wide so I was having to play a lot of frogger. It was a little frustrating. During the last mile I lost my bearings a bit. I kept thinking I saw where we turned for the finish, but then would realize it was further up. It was probably around mile 12.5 that I started feeling it. I knew I had a little left in me, but didn’t want to push until I was sure where the finish line was exactly. Then finally I saw the turn… here we go… game face engaged. Turning down the street to the stadium, I got crossed by a pedestrian who I almost took out. Luckily they had a quick enough reflex when yelled “WATCH OUT!” After that almost catastrophe, I continued down the street to what I thought was the entrance of the stadium. I was pushing. I turned the corner and no stadium entrance. WHERE THE HELL IS THE FINISH? At this point I had to be running a sub-8:00mm and I was just trying to keep it together. Finally, FINALLY we turned into the stadium and I could see the finishing chute. It was just a short stretch through the field. I checked my form, I checked my breathing. Mentally I slowed down while pushing my body even harder. And finally I crossed the finish line. I had just finished my first half marathon. My friend took a bunch of photos of me running to the finish so I made an animated gif. Right off the finish, my friend flagged me down. I was feeling a bit nauseous so we walked to get gatorade then to stretch and wait for our other friend. I couldn’t believe how fast I had run that last 5k! I felt great. I had my medal and I was proud, but it was different from the 10 miler. I didn’t feel like I had just gone through something really rough, I felt like I had conquered something with a smile. I had done it right. And I knew I could do it better. After meeting up with our other friend we headed back to the car. I had registered for another race that day, a neighborhood 5k, before having to register for the half marathon. It didn’t start for another hour and a half I was seriously contemplating running it. In the end, the traffic too long and by the time we got back to the apartment we were all ready for brunch. I celebrated my accomplishment with a real beer, fries, and a burger with egg and bacon. Later that night I discovered that I had run my fastest 5k ever at the end of the half marathon. After the Staten Island half marathon.